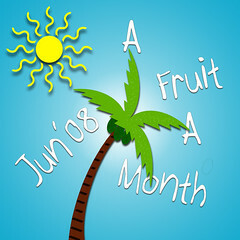 A Fruit A Month, the monthly event that puts spotlight on a fruit comes to Tasty Palettes. Started by Maheswari of Beyond The Usual, this event has been going on for quite sometime now. Which also means, many of the fruits we enjoy on a daily basis have already received their deserved attention. While I was searching for a fruit that was easily available, I had to think outside the box. There are many fruits disguised under various names in our every day lives. And one such fruit is coconut. Yes, coconut is not a nut, but a fruit. 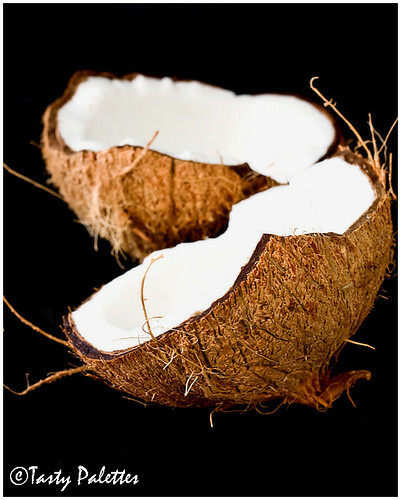 So lets celebrate coconut this month as ‘The fruit of the month’ – AFAM: Coconut. Coconut is a drupe, which is described as a fruit with an outer fleshy part, enclosing a hard shell, which in turn enwraps the seed. Peach, avocado, walnut, pecan are some that belong to this category. In a coconut, the outer fibrous part (mesocarp) encloses a hard shell (endocarp). Inside this hard shell is the edible white flesh (endosperm) and coconut water. Technically the outer fibrous part is the fruit. But since it is nowhere near edible, lets consider the other flavoursome parts; the white flesh, thirst-quenching coconut water, rich coconut oil and other coconut derivatives, for this edition of AFAM. Prepare a vegetarian/vegan recipe with coconut as the star ingredient and post about in your blog between now and 30th June ’08. Any cuisine, any course is acceptable as long as it features coconut. Any article on coconut is also welcome. Provide a link back to this announcement. 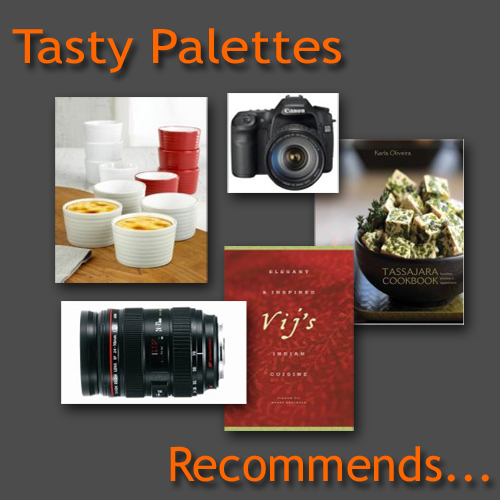 Send a mail with AFAM – Coconut in the subject line to tastypalettes@gmail.com with the following details. If you don’t have a blog but would like to participate, send an email with your name, recipe and an optional photo. I will include in the roundup. Older posts are accepted if they are re-posted with a link to this announcement. The roundup will be posted in the first week of July. Maheswari, thank you for allowing me to have fun with one of my favorite fruits for a whole month. Updated on Jul 8, 2008: Event Roundup here. Great choice of fruit Suganya! Shall get thinking cap on. I'll do my best to submit something... It all depends on how much free time I can pull together! That is such an interesting choice. Hmm... let me think. nice choice..will come up with something.. Interesting choice- thannx to the blog events, which makes us think out of the box. Else would we hv ever thought of coconut as fruit. Count me in. Between Sig and you, do you realize you can make me go the RCI Karnataka route all over again... coconut and tamarind... quintessential konkani food ingredients... and I have so many recipes sitting just for you. Also, is alcohol vegan, vegetarian or meat? I am happy to see your positive response. Hoping to receive your wonderful creations. Divya, tender coconut is acceptable. Any edible part of coconut is ok.
Raaga, Konkani foods? Bring it on :). Alcohol is beyond vegetarian or vegan category. Feel free to use it. thank you for choosing coconut. yup - super choice - already know what to make - something i've been meaning to try for a long time - and thanks for clarifying that Divya. now coconut is a fruit!..I forgot my botany!..heheh..will send some entries for sure! I'll be traveling to India soon will post recipes of coconut from there. Beautiful picture Sug. A very good choice. I will try to come up with something, time permitting. I am certainly looking forward to the roundup. great choice, suganya, i am excited. pardon me if i sound silly, but are eggs allowed?? JZ, Eggs are allowed. Looking forward to your participation. Great choice and looking forward to participate! I didnt know till now that coconut is a fruit.... yours is very informative too!!!! great work!! I have a recipe in mind too!!!!! there's something for you at jugalbandi. congrats. Nice selection..Will surely send something.. Sorry i send my last comment accidently through H's id (which was default in this m/c).Please copy and paste that in this comment , if u can...:( and congrats on the CLICK win..
is coconut cream/milk acceptable? count me in!! Arfi, coconut milk, cream, or any other derivatives of coconut are accepted. oops..i have deleted my comment posted earlier suganya..mine was stupid question...actually i was abt to ask if coconut milk is allowed...b4 i forgot to write milk after coconut...he he..
Hi Suganya! been in and about your posts before. great going with AFAM. Just sent in my entry. First time - feels great! Do drop by my blog. Hi Suganya, emailed my entry. Let me know if you need any other details. I am so bummed I missed this event :-( On the bright side, thank you for hosting and looking forward to the round-up!